Displeased Disfigurement started in 2001 when original members Darius and Nick set out to start a death metal band. Adding Dominic and Mitch to the line up, playing numerous shows in South Africa, Displeased Disfigurement is also responsible for one of South Africa biggest metal fests, Rocktober Fest. In 2013, Displeased released their full length album Extermination Process. In 2015, Nick parted ways with the band, resulting in Displeased Disfigurement’s search for a new drummer. After a few auditions in 2016, we found a replacement drummer – Riaan Ondier Els, formerly from Bile of Man. With new material, the band also took new direction to what we wanted – something way heavier and more brutal. In 2017, Displeased Disfigurement finished recording our new album entitled Origin Of Abhorrence, released on the 9th of June via Canadian label CDN Records. Released June 1st, 2018 - Australia, South Africa and Canada come together to bring you the "International Solidification 3-Way Split" Featuring Gape, Displeased Disfigurement, and Existential Dissipation. 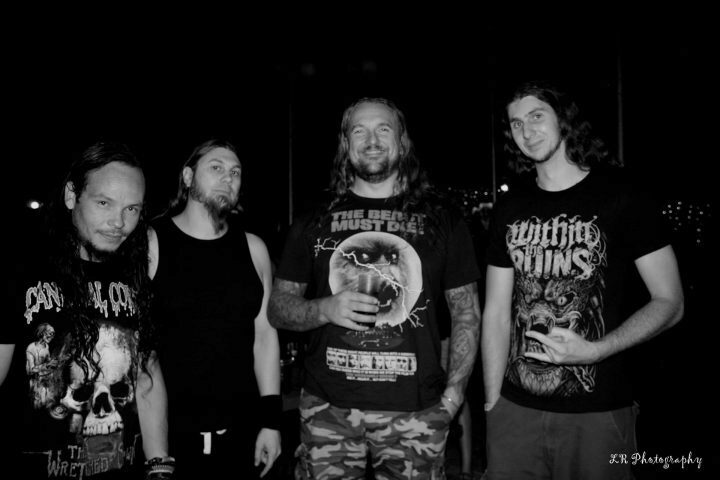 Extermination Process was originally released in 2012 with only 100 copies produced by the band. Re-released now by CDN Records and re-mixed and mastered by Visceral Sound. Brutal South African Death metal! Origin of Abhorrence is an album that derives exactly what is said, the world and the virus that dwells deep into it... In this album we hit topics that every person faces daily.